Jun 5 – Leslie Van Houten was denied parole for the 19th time today in a hearing at the California Institute for Women in Corona, California. She will not be allowed another hearing for five years. Van Houten, the youngest of those responsible for the Tate-LaBianca murders, was sentenced to death in 1971 for her part in the August 10, 1969 murder of Leno and Rosemary LaBianca. The following year, Van Houten saw her sentence commuted to life after the California supreme court outlawed the death penalty. On Friday, August 13, 1976, a California court of appeals ruled that Van Houten was denied a fair trial because her attorney Ronald Hughes had disappeared while the trial was in progress. The appeals court reversed Van Houten’s conviction and ordered her to be retried. That same month, Keith attempted to get a temporary restraining order issued against the CBS Television Network that would’ve prevented the network from airing the movie Helter Skelter. In February of that year, Leslie told journalist William Farr that the Manson family was never as big as the media made it to be. “There really were only about 10 girls and three guys although people came and went,” said Van Houten. Van Houten told Farr she was embarrassed to admit she actually believed in Charlie’s Helter Skelter and that she continued to have nightmares about the murders. The retrial began on Monday, April 18, 1977 at the new courthouse across the street from the Hall of Justice. The mood was completely different than it had been seven years earlier. Van Houten did not arrive to court smiling or singing as she had in 1970. There were no vigils on the street corners below. Testimony began the following day, with Deputy District Attorney Stephen Kay first calling Susan Wolk to the stand. Wolk, the 28 year-old daughter of Rosemary LaBianca testified that upon arriving home from a water skiing trip, her brother Frank phoned her, concerned about something at their parents house. Along with her then-boyfriend Joe Dorgan, Wolk met with Frank and went to the house. “Joe and Frank went in first,” continued Wolk. “I walked into the kitchen and dining area.” Her brother and Dorgan stopped suddenly and wouldn’t let her continue into the living room. The two turned Wolk around towards the kitchen and out the back door. Leslie Van Houten sat motionless behind a counsel table, trying her best not to make eye contact with the physical evidence or Wolk. Dorgan took the stand next and told the jury what he had seen in the living room at 3301 Waverly Drive. By days end, the jury had also heard testimony from the first officer to arrive at the residence, William Rodriguez, as well as the last person to see the LaBiancas alive, newspaper vendor John Fokianos. The following week, Linda Kasabian returned and gave an unemotional account of the Tate murders “as if she were describing a traffic accident for which she had no responsibility,” wrote one journalist. “[Leslie] is being tried for the Sharon Tate murders and she wasn’t even there,” an angry Maxwell Keith told reporters outside of court. Leslie, dressed in a pink blouse and plaid pant suit, took the stand on Thursday, May 5. She testified that LSD had been smuggled into jail and she took acid throughout her original trial. According to Van Houten, Manson had thrown a razor blade across the table and instructed the girls to carve Xs into their foreheads. She continued, saying that Manson had told her she would need to testify. Van Houten said that she was visited in jail with instructions for her to say that Manson hadn’t been around at the time of the murders and didn’t have any knowledge of them. On Thursday, June 9, Leslie Van Houten was back on the stand, talking about life with the Manson family. Leslie’s testimony continued the following week when she told the jury she that at the LaBianca residence, Charles “Tex” Watson had handed her a knife and told her to do something, and that she stabbed Rosemary LaBianca about 14 times in the lower back. “I know I just kept doing it over and over again,” said Van Houten. Later in the trial McGann testified that when he discussed immunity with Van Houten, he was talking about arson charges, not murder. Throughout the trial, Maxwell Keith called five psychiatrists to the stand. All testified that Van Houten was mentally ill at the time of the murders and incapable of premeditation, the requirement for first degree murder. Their testimony was however contradicted on June 21, when Stephen Kay called Dr. Joel Fort. “She did harbor malice and did manifest an intent to kill another human being,” said Dr. Fort. Dr. Fort explained his opinion based on that fact that Van Houten had discussed killing before the murders and then made efforts to hide them after they had be committed. On June 27, Maxwell Keith played a tape recorded interview Charles Manson did with Dr. Fort. Manson continued to claim he did not direct Van Houten and the others to kill the LaBiancas. However, Manson did admit somewhat that he had influence on her. The recording also somewhat contradicted the defense’s contention that excessive drug use had led to Van Houten’s diminished capacity. “We were not all that much into drugs,” said Manson. “Everybody said we were but that’s not true. The truth was we took acid whenever it was around. Sometimes it would be maybe once a week, sometimes once a month, sometimes three times a month. After 10 weeks and 38 total witnesses, testimony had ended. The following day Maxwell Keith told the jury that members of the Manson family were sick and argued that Leslie was guilty of manslaughter not first degree murder. The jury began their deliberations on Friday, July 10. After a week of deliberations the jury asked to listen to the 4 hour recording of Leslie and Sgt. McGann, as well as Dr. Fort’s May 1976 interview with Charles Manson. A week later the jury appeared in court to ask legal questions about diminished mental capacity. On Monday, July 25, after two weeks of deliberations, a male juror had to be replaced because of illness. Judge Edward Hinz instructed the jury that they would need to disregard their previous 13 days of deliberations and start over. A mistrial was declared on Saturday, August 6, when after 25 days of deliberations the jury was still deadlocked. The split, according to foreman Bill Albee, was seven for first degree murder and five for manslaughter. Leslie Van Houten was freed on a $200,000 bond on Tuesday, December 27, 1977. Her freedom was spent with friends and family who helped her get reacquainted with the world outside prison walls. Leslie lived a low-key life and got a job working as a legal secretary. Her third trial began in the spring of 1978. This time Deputy District Attorney Stephen Kay changed his strategy, attempting to get Van Houten convicted on murder committed in the act of robbery because she had taken coins and clothes from the LaBianca residence. On Wednesday, July 5, 1978 a jury found Leslie Van Houten guilty on two counts of first-degree murder and one count of conspiracy to commit murder and she was sentenced to three concurrent life terms a month later. Van Houten was returned back to prison on August 17, 1978 and with a credit of eight years and 20 days time served, she was immediately eligible for parole. Her first hearing was in January of 1979 and although she was denied, she received favorable reviews from prison psychologists and prison staff. Leslie’s third parole hearing was held on Wednesday, April 22, 1981. The three member board commended Van Houten on her positive adjustment, but felt she needed to serve more time due to the nature of the crime. Leslie’s attorney, Paul Fitzgerald, told the panel that they ought to be ashamed of themselves. “I find your decision intellectually dishonest and the worst kind of pandering to public sentiment,” said Fitzgerald. In Fullerton, California, Rosemary LaBianca’s brother, H. Russell Harmon, was happy to hear the news. Hearing after hearing, years became decades and nothing seemed to change. Panel after panel praised Van Houten’s progress behind bars but ultimately denied her release because of the nature of the crime and Van Houten’s unstable social history. For decades it seemed as though her release was just one or two years away. But that day never came. 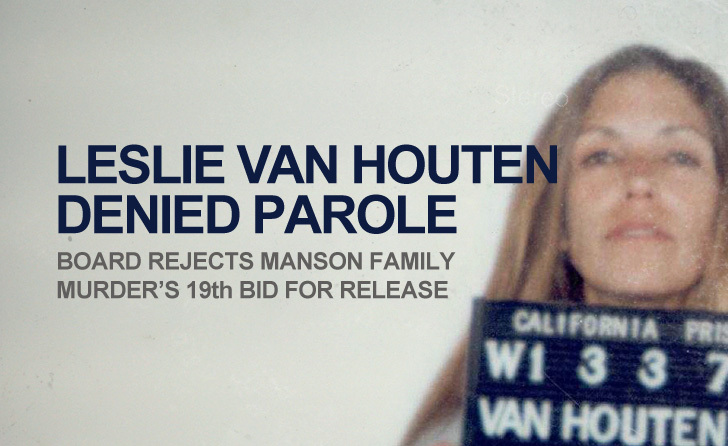 Van Houten’s release had been opposed by the Los Angeles District Attorney’s Office since she became eligible for parole in 1978. Deputy District Attorney Stephen Kay – who assisted in her original prosecution, and was the lead in her two retrials – attended her parole hearings until he left the D.A.’s office in 2004. When friends of Leslie began collecting signatures petitioning for her release, Kay enlisted the help of Sharon Tate’s mother Doris Tate. Kay and Tate together worked on their own campaign collecting several hundred thousand signatures from people opposing Van Houten’s release. Doris Tate went on to become a powerful victim’s rights advocate and campaigned the cause up until her death. The LaBianca family has opposed Van Houten’s release as well. Leno LaBianca’s nieces and nephews have regularly attended Van Houten’s hearings making victims impact speeches. In 2006, Leno LaBianca’s nephew John DeSantis read a letter from Leno’s eldest daughter Cory. In the letter, Cory LaBianca related to the board fond recollections she had from time spent with her family at 3301 Waverly Drive and how those memories were fractured by the murders. Van Houten, now 63, has been a model prisoner excelling in countless prison programs during her lengthy incarceration. Her one and only rules infraction occurred in 1976 and is no longer even in her file. Her many supporters both in and outside of prison have argued that Leslie should’ve been released decades ago. Leslie lost her closest supporter in 2012 when her father, Paul Van Houten, passed away at the age of 93. While Van Houten has an exemplary post-conviction record, she like many others associated with the Manson murders remain unsuccessful in separating themselves from the everlasting impression left by the murders and unforgettable trial that followed. Leslie Van Houten will not be allowed another hearing until 2018. Thanks so much for posting this, Very illuminating. This woman has already paid for what she did, it´s time to be released, many years in prison for her role in those crimes. She´s very embarrassed, it´s time for Labianca´s family have compassion for this woman. What can I do to help Leslie get paroled ? I am sorry, but I only can say: she has to stay in prison. She wasn’t forced to do this, many others in that bunch died not go and enjoy the murde4r of innocent people. My feelings go the victims, to friends and families, which have to live with what happened. To the families of the muderers, too. I feel shame if I read van Houten blames the divorce of her parents. Oh my God! My parents were divorced, too. I lost my father when I was a baby, always longed to have one, and he even did not care for me, I NEVER saw him. And my sister was elder, she lost her father which she loved that day. And we both did NOT go and slaughter humans! She choose to enjoy this, she laughed about what she had done, and now it’s time for pay. I will sign against her. I am happy your country does not let muderer out after fifteen years; young ones, as van Houten was, after eight (!!!). We need to act like the U.S. does. Why does that Stephen Kaye just climb off it. Why put Leslie through all this rehabilitation and she becomes sane and sitting in a chair clean cut and exemplary record she’s still denied parole because of Mr. Kaye and his entourage of cryers. Climb off it! O.J. Simpson ripped two people apart but that’s okay. Billy Flynn shot the back of a young boy’s head off but that’s okay! Those fat Tate sisters need to just forgive and let it go. ANYONE who does not forgive ANYONE will not be forgiven by God come judgment day and THAT is in the Bible. Hey Mr. Kaye, two wrongs make a right? You know damn well, just like the board knows that Leslie had nothing to do with Tate and she’s paid her debt to society. Let it go already and stop trying to be some kind of burlesque hero. Let me know what I can do to help Leslie get paroled too.